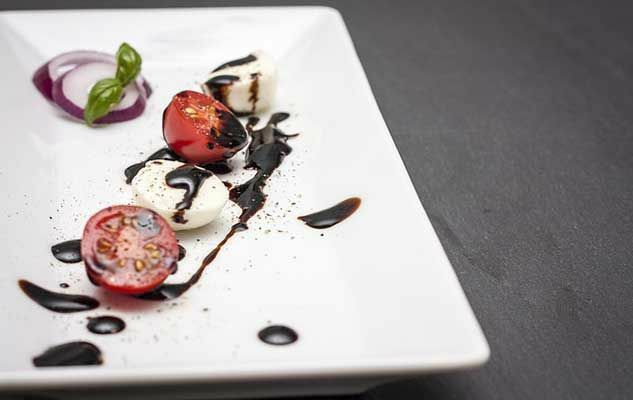 Over the past few years, balsamic vinegar has increased in popularity and can now be found in local supermarkets. But what exactly is it made of? In reality, the commercial grade vinegar most commonly available at low prices is not genuine balsamic vinegar, but industrial wine vinegar, to which some colouring and artificial aromas are added. Real balsamic vinegar is one of the two following products: aceto balsamico di Modena, that is used as vinegar, or aceto balsamico tradizionale di Modena, a condiment that should be used very sparingly – only a few drops at a time. These two products are made from the must (concentrate) of the Trebbiano grape that is boiled in cauldrons, and then aged in oak barrels. This ageing lasts between 3 months to a few years for the vinegar, and between 12 to 25 years for the condiment, which must be transferred every year into a smaller barrel and in specific climatic conditions (hot during the day, cold during the night). In the Northern Italian region of Modena, aceto balsamico has been produced since the Middle Ages. In the olden days, it was sought after as much for its medicinal properties as for its culinary worth. It was called balsamico (meaning ‘balsamic’) because it was claimed that it could bring the dead back to life! The price of this nectar varies according to the age and the quality of production: You may end up paying around $20 for a 250ml bottle of balsamico di Modena (vinegar) and more than $50 for a 100ml bottle of balsamico di Modena tradizionale (condiment). Originally published in the Journal de Montréal on March 6, 2010. Now I know why my balsamic vinegar doesn’t taste nearly as good as the one in good restaurants! So where do I get the true stuff? I would recommend you shop for it in any Italian grocery store. With a little luck, you may even get to sample some. In Montreal, Milano (6862, Saint-Laurent) has a very good selection, at very reasonable prices. Here in Halifax you can find a wide range of balsamic vinegar at the Italian Gourmet Market on Young Street and at Pete’s Frootique.